Interested in licensing the music of Alice Coltrane? Alice Coltrane was an uncompromising pianist, composer and bandleader, who spent the majority of her life seeking spiritually in both music and her private life. 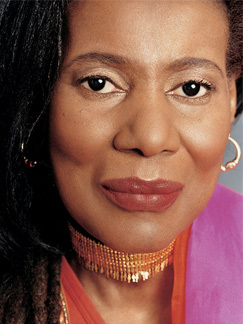 Music ran in Alice Coltrane's family; her older brother was bassist Ernie Farrow, who in the '50s and '60s played in the bands of Barry Harris, Stan Getz, Terry Gibbs, and especially Yusef Lateef. Alice McLeod began studying classical music at the age of seven. She attended Detroit's Cass Technical High School with pianist Hugh Lawson and drummer Earl Williams. As a young woman she played in church and was a fine bebop pianist in the bands of such local musicians as Lateef and Kenny Burrell. McLeod traveled to Paris in 1959 to study with Bud Powell. She met John Coltrane while touring and recording with Gibbs around 1962-1963; she married the saxophonist in 1965, and joined his band, replacing McCoy Tyner, one year later. Alice stayed with John's band until his death in 1967; on his albums Live at the Village Vanguard Again! and Concert in Japan, her playing is characterised by rhythmically ambiguous arpeggios and a pulsing thickness of texture. Subsequently, she formed her own bands with players such as Pharoah Sanders, Joe Henderson, Frank Lowe, Carlos Ward, Rashied Ali, Archie Shepp, and Jimmy Garrison. In addition to the piano, Alice also played harp and Wurlitzer organ. She led a series of groups and recorded fairly often for Impulse, including the celebrated albums 'Monastic Trio', 'Journey in Satchidananda', 'Universal Consciousness', and 'World Galaxy'. She then moved to Warner Brothers, where she released albums such as 'Transcendence', 'Eternity', and her double live opus 'Transfiguration' in 1978. Long concerned with spiritual matters, Coltrane founded a centre for Eastern spiritual study called the Vedanta Center in 1975. Coltrane returned to public performance, after a long hiatus, in 1998 at a Town Hall Concert with Ravi and again at Joe's Pub in Manhattan in 2002. She began recording again in 2000 and eventually issued the stellar ‘Translinear Light’ on the Verve label in 2004. After the release of ‘Translinear Light’, she began playing live more frequently, including a date in Paris shortly after Hurricane Katrina in 2005, and a brief tour in fall 2006 with Ravi. Coltrane died on January 12, 2007 at Los Angeles' West Hills Hospital and Medical Center.